The G400P provides scalable connectivity to GSM networks for your linux machine. It comes with fully GPLed drivers for the linux 2.4.X and 2.6.X kernels. 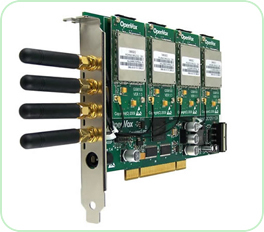 The OpenVox GSM card can be connected to any other OpenVox card to build a real TDM switched PBX. G400P enables full flexibility to traditional telephony systems to go GSM network. It also allows systems integrators to transform highly priced fixed to mobile voice traffic into a much cheaper mobile to mobile call management, with considerable savings. G400P works with Asterisk®, Elastix®, FreeSWITCH™, PBX in a Flash, trixbox®, Yate™ and IPPBX/IVR projects as well as other Open Source and proprietary PBX, Switch, IVR, and VoIP gateway applications.